Seva (Say-va) is a Sanskrit word meaning selfless service. Our grassroots programs work to meet the basic human needs of those living in poverty. Seva was formed with a mission to alleviate suffering and build healthy communities. Seva was founded by public health expert Dr. Larry Brilliant, spiritual leader Ram Dass, and humanitarian activist Wavy Gravy, along with a compassionate group of doctors and other dedicated individuals. Musicians such as the Grateful Dead, Bonnie Raitt, Jackson Browne, David Crosby, Graham Nash, and many many more are big supporters of Seva. Bob Weir serves on Seva's advisory board. Seva Foundation has effectively channeled our donors' gifts into compassionate action since 1978. When you donate to Seva, you give gifts that really matter — the gift of clean water, the gift of affordable health clinics, the gift of literacy, the miracle of eyesight, and much more. Thanks to all the musicians, volunteer staff, and you for supporting Seva ! Wavy Gravy, activist clown, former Ben & Jerry's flavor, hippie-icon, flower- geezer, is a founding board member of the Seva Foundation. He is the creative director of Camp Winnarainbow, a circus and performing arts camp in Northern California. 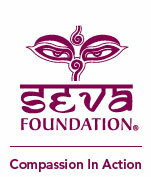 Seva Foundation - Compassion In Action!